The World Cup is officially coming to North America in 2026, and Bay Area soccer fans could have the opportunity to see the world-famous sporting event right in their backyard. Kris Sanchez reports. The World Cup is officially coming to North America in 2026, and Bay Area soccer fans could have the opportunity to see the world-famous sporting event right in their backyard. 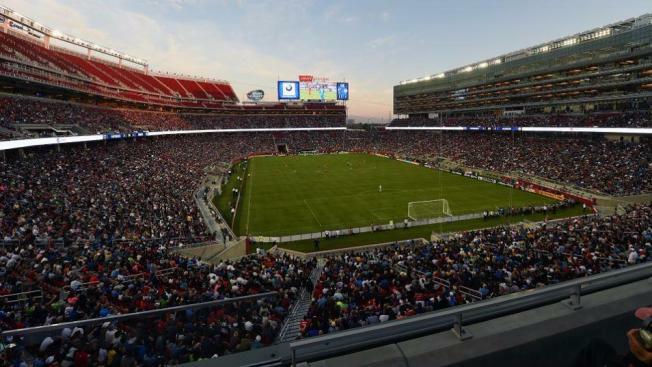 Levi's Stadium in Santa Clara is listed as one of the 23 potential venues in North America — three in Mexico, three in Canada and 17 in the United States — that could play host to matches during the tournament. That list of 23 hosting sites will eventually be whittled down to 16 in 2020 or 2021, according to U.S. Soccer. FIFA voted Wednesday to play the 2026 World Cup in North America, with the joint bid from the United States, Mexico and Canada beating out Morocco's bid, 134 votes to 65 votes. The 2026 competition will be the largest World Cup in history with 48 teams vying for the trophy. The United States in total will play host to 60 matches, including the final, which is proposed to take place at MetLife Stadium near New York City. Mexico and Canada will each host 10 matches during the competition. A World Cup host nation's team automatically qualifies to compete in the competition, but with three countries slated to host in eight years, the automatic qualifying process becomes complicated. South Korea and Japan, the only other nations to host jointly, both qualified automatically in 2002, but the FIFA Council will decide if all three North American countries will automatically feature in the 2026 tournament. The United States hosted the World Cup back in 1994. Mexico has twice hosted the competition, in 1970 and 1986. While Levi's Stadium primarily serves as the home to the San Francisco 49ers, it is no stranger to hosting meaningful soccer tilts. The venue previously played host to Copa América Centenario and Gold Cup matches. Wednesday's vote comes one day before the 2018 World Cup kicks off in Russia.